It is impossible to comprehend our own mortality and what it means, that much is true. You may find yourself contemplatively musing over such questions as: “Where do these thoughts go? My mind! What will it become? An empty vessel? An infinite energy traversing space, secular and circling through vast, dark plains?” To be or not to be, that truly is the question. “What dreams may come once we have shuffled off our mortal coil?” pondered William Shakespeare. For we fear what we do not know, but know we must. These lugubrious ruminations may plague you–languishing in the murky recesses of your mind–or maybe they don’t, either way, there is help it seems. Some fascinating new research has shown that surrealistic art could be potentially beneficial to those who have faced their own mortality. Certainly an interesting prospect to consider: having been confronted by your own demise, or even asked to contemplate it, you’re more likely to find comfort in the strange and wonderful than you are the familiar and the commonplace. Verena Graupmann of DePaul University reports that surrealistic art can in fact bring poignant meaning to one’s life. Graupmann explains that the unfamiliar, disconcerting and even unnerving quality of surrealistic art pieces can unshackle and liberate someone’s thinking from “mundane limitations and fears”, to the connection of a whole new level of understanding and holistic meaning. To bolster this argument, Graupmann and colleagues conducted two experiments. The first experiment gathered up 87 undergraduate students, split them into two groups and asked one half to describe the emotions aroused in them at the thought of their own death. Following this, they were told to jot down what they think will happen to them as they physically die. The other half of undergraduates were asked to answer parallel questions about dental pain. 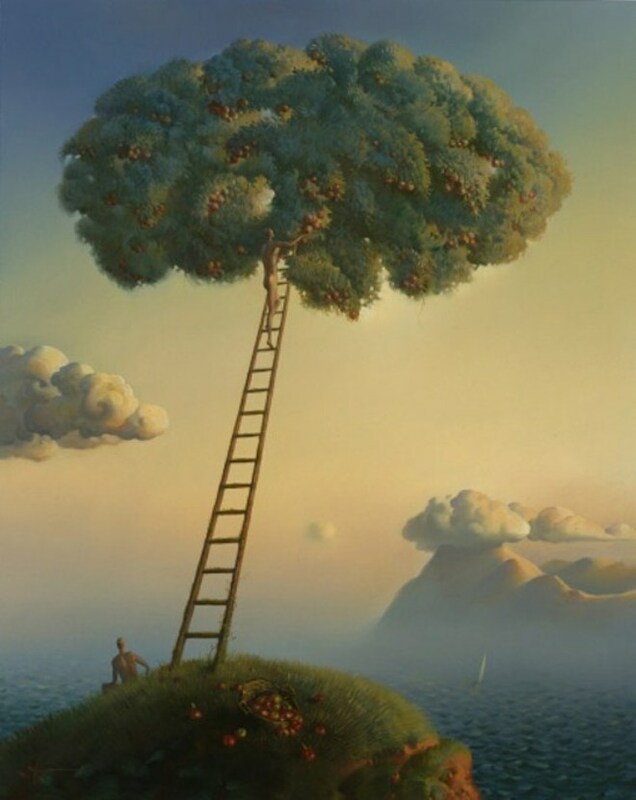 Participants then looked at one of two paintings—a “realistic” rendition by Edward Hopper, and a surrealistic painting by Vladimir Kush, as pictured below. They were then instructed to respond to a series of statements aimed at determining specific emotions brought upon by viewing each painting–these emotions included anxiety, consolation, and reassurance. For the second experiment, Graupmann and colleagues used functional MRI technology to measure brain activity of 15 volunteers while viewing 32 realistic and 32 surrealistic paintings. Participants were exposed to pairs of words that were either death-related, disgust-related, or neutral. Image: Max Ernst, L’Ange du Foyer ou le Triomphe du Surréalisme (1937), private collection. Results showed different patterns of brain activity in participants primed with thoughts of death or disgust as opposed to those primed with an emotionally neutral subject. 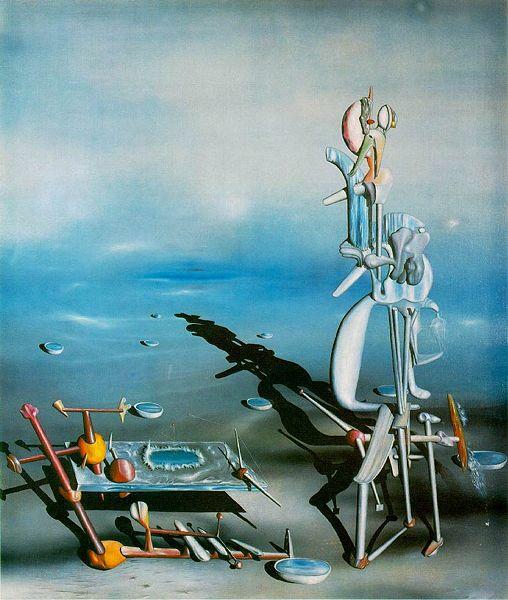 More specifically, those study participants who looked at the surrealistic paintings showed generally higher levels of neural activation in regions of the brain associated with “self-referential processing” (the precuneus and the medial prefrontal cortex). It has been argued that there is a strong emotional bind between disgust and death, and even that organic, creaturely things remind us as humans of our own mortal bodies. It is not too outlandish perhaps to then suggest surrealistic art provides us with a platform on which to reflect and introspect, unlike other artistic mediums. 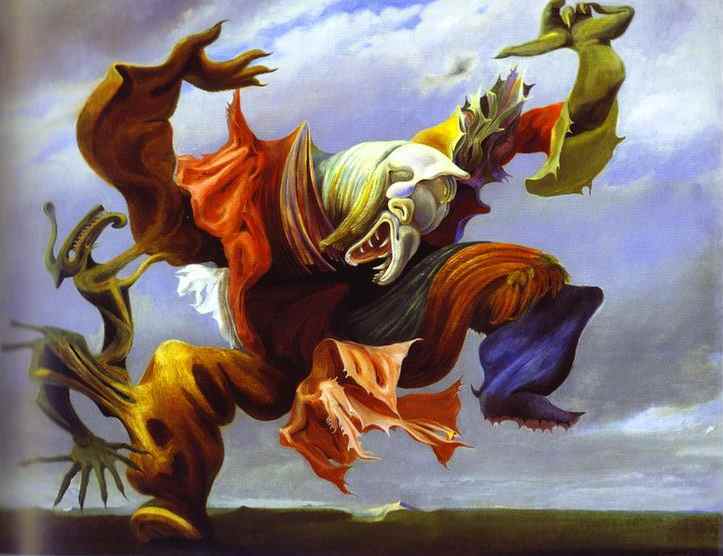 Researchers concluded that surrealistic art can provide meaning when contemplating mortality. Participants introspectively opened themselves to the thought of their own death, and a stream of unconscious self-reflection came with it. It is possible they found reassurance staring into that incomprehensible abyss–results suggest as such, anyway. There is no way to truly comprehend mortality. We cannot know, nor should we. It is comforting to know that surrealism may provide some answers, though. You may however find comfort in the impartiality of it all. Mortality and decay; disgust and death. Stark realities shunned at each desperate, looming turn. We organisms: scaling, twisting through paths, forged and fitted among this unique ubiquity of struggle and pressure; joy and pleasure. A truth that indiscriminately equalises. If you liked this, maybe you’d be interested to know what our prehistoric ancestors chatted about. Or, if you have seen The Babadook, check out Julian’s psychological analysis of its key characters.